The Michael C. Carlos Museum in DeKalb County includes objects from ancient Egypt, Greece, Rome, the Near East and the ancient Americas. Widely acclaimed as the South's premier museum of ancient art, the Michael C. Carlos Museum is part of Emory University in Atlanta. 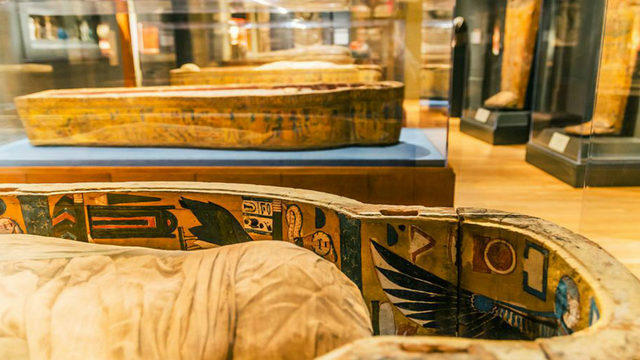 Some 17,000 artifacts from ancient Egypt, the Near East, Greece, Rome and Africa give visitors a glimpse into the art and history of world culture from the Renaissance to the present day. Located at the heart of Emory University's campus, the Carlos is contained in a landmark building designed by noted architect Michael Graves. A 1985 interior renovation and subsequent 35,000-square-foot expansion in 1993 laid the groundwork for the Carlos Museum to become the destination for special exhibitions it is today. Location: Michael C. Carlos Museum of Emory University, 571 South Kilgo Circle. Exhibits: The Carlos is known for inspirational curation, from locally organized exhibitions to those from nationally and internationally celebrated institutions that include the Louvre, British Museum and Israel Museum. "Divine Felines: Cats of Ancient Egypt," featuring cats and lions (along with some dogs and jackals) in ancient Egyptian mythology, kingship and everyday life was a popular exhibit in 2018. The first half of 2019 brings the startling and moving "DO or DIE: Affect, Ritual, Resistance" exhibit from Dr. Fahamu Pecou. It explores the intersections between African-based spiritual traditions and the United States' political and societal violence against black male bodies. Things to see and do: Emory provides an online calendar of events at the Michael C. Carlos Museum Atlanta and the selection is both diverse and fascinating. Examples include lectures from noted thinkers, many of them art historians, and the September Beltline Parade lantern workshop. Podcasts: The Carlos Museum has prepared Carlos Conversations, a series of podcasts that looks at objects in the Carlos Collection in new and unusual ways by sparking conversations between distinguished members of Emory's faculty. Patrons who download a podcast to their smartphone and bring it to the museum receive free admission. Tickets: General admission for adults costs about $8, with $2 discounts for students, seniors and children ages 6-17. Emory University students, faculty and staff with up-to-date IDs are admitted free. Groups of more than 10 can request a group tour with at least two weeks' advance notice from an online form. Directions: Link to a map and detailed directions to the Carlos from its website. The page also gives general directions for reaching the Carlos by car via 75 North, 400 South and West or East Atlanta. To reach the museum using public transportation, take MARTA bus line 6 Emory from Inman Park and Lindbergh stations or 36 North Decatur from Avondale and Midtown stations. Parking: Accessible parking for the Carlos is available in the Oxford Road and Fishburne Drive parking decks. Weekdays before 4 p.m., handicap-accessible parking is available in the Oxford Road parking deck. From there, patrons who require handicap accessible parking would enter the Oxford Road building and take the elevator to the top (Plaza) level, then follow accessible route path markers to the rear (Plaza Level) entrance of the museum. On weekends and after 4 p.m. daily, handicap-designated parking spaces are available on South Kilgo Circle, adjacent to the rear (Plaza Level) entrance of the museum. To park in those spaces, drivers must display a government-issued hangtag. The Carlos website links to a printable Emory parking map that details an accessible route to the museum from Oxford Deck. Hours: The museum is open Tuesday through Friday from 10 a.m. to 4 p.m.; Saturday 10 a.m. to 5 p.m.; and Sunday 12 noon to 5 p.m. It is closed on Mondays and Emory University holidays. A STUNNING collection of Egypt artefacts - some linked to famous pharaohs - are expected to fetch £60,000 at a UK auction on Monday. A huge collection of Egyptian "shabti figures" is to be sold at auction - with some items more than 3,000 years old. Shabtis were placed in tombs and intended to act as servants or minions for the deceased should they be called upon to do manual labour in the afterlife. The figures were collected in the 1920s by Hans Moller Hansen during trips to Egypt and later inherited by his grandson, Hans Nielsen, in Denmark. Around 90 of the rare figures will be sold in an Antiquities, Ancient Art and Classical Coins Auction at Hansons Auctioneers, Derbys., on July 30. James Brenchley, head of antiquities at Hansons, said: "This really is a stunning collection of Egyptian shabti figures. "Some have royal pedigree being linked to pharaohs, the monarchs of ancient Eqypt. "These artefacts have been treasured and researched by members of the Hansen family for nearly a century. "One of the royal Shabti figures is for Khaemwaset, fourth son of famous pharaoh Rameses II. "Khaemwaset was born in 1303 BCE and died in 1213 BCE. His name translates to, 'He who appears in Thebes'. "A particularly rare triangle glyph (symbol) can be seen on the bottom of the piece, which could indicate it was a temple figure. "Khaemwaset was born into a highly influential period of Egyptian history and would have experienced the famous battle of Qadesh against the Hittites in Syria. It has an estimate of £4,000 to £6,000. "Another rare artefact is an upper section of a shabti for the famous New Kingdom pharaoh Seti I circa 1279 BCE. Seti I was the father of Rameses II and the son of Rameses I. "After the serious decline of the Egyptian kingdom and the reign of Akhenaten - the father of Tutankhamun - Seti led forces over the borders to reinstate Egypt's power and stronghold over the empire." "Shabti figures for Seti have reached tens of thousands on the antiquities market and I would expect this stunning item, with important context, to reach over £1,000. "The items come from a good provenance background with a long family ownership, dating back nearly a century." The Egyptian Royal Khaemwaset shabti, lot 142, and Royal Seti I pharaonic shabti section, lot 247, will be sold at Hansons Auctioneers, Heage Lane, Etwall, Derbys., on July 30, as part of a two-day Antiquities, Ancient Art and Classic Coins Auction on July 30 to 31. In 1913 on the outskirts of Cairo, an inventor from Philadelphia named Frank Shuman built the world's first solar thermal power station, using the abundant Egyptian sunshine to pump 6,000 gallons of water a minute from the Nile to irrigate a nearby cotton field. World War I and the discovery of cheap oil derailed Shuman's dream of replicating his "sun power plant" on a grand scale and eventually producing enough energy to challenge the world's dependence on coal. More than a century later, that vision has been resurrected. The world's largest solar park, the $2.8-billion Benban complex, is set to open next year 400 miles south of Cairo in Egypt's Western Desert. That is no small feat for a country that's been hobbled by its longtime addiction to cheap, state-subsidized fossil fuels and currently gets more than 90% of its electricity from oil and natural gas. "This is a big deal," said Benjamin Attia, a solar analyst with U.S.-based Wood Mackenzie, talking about the Benban complex. "I can't think of another example where so many big players have come together to fill the gap." Officials and international finance organizations tout the potential of Egypt's renewables sector to create jobs and growth as well as reduce emissions in a country whose capital was recently named the second-most polluted large city on Earth by the World Health Organization. The government's aim is that by 2025 Egypt will get 42% of its electricity from renewable sources. Last week, Egyptian President Abdel Fattah Sisi inaugurated several big electricity projects, including the expansion of massive wind farms on the gusty Gulf of Suez in the Red Sea. Russia has promised to help build and finance a $21-billion nuclear power plant on Egypt's north coast. But if flashy green energy megaprojects like Benban are drawing much of the attention, small businesses are responsible for 80% of private-sector jobs, said Khaled Gasser, who founded the Solar Energy Development Assn., a local industry group. "This is the real market," he said. Ahmed Zahran, 38, started KarmSolar with four friends working out of a cafe after his old bosses fled the country. He had tried in vain to persuade the private equity firm to invest in clean energy. "We were fired by an … who represented everything we hated about this country, so we decided, let's do it ourselves," said Zahran, who figured solar power was a no-brainer in a nation that is more than 90% desert. Zahran has also delved into green architecture, designing off-grid eco-lodges and a sustainable "worker's village" for seasonal farmhands in Egypt's Bahayira Oasis, a desert outpost of olive and date groves. As the government has made good on its promise to gradually cut energy subsidies — on July 1 electricity prices rose an average of 26% — more companies are exploring the possibility of adding solar systems to the apartment buildings where most of the country's urban population lives. The country's green energy start-ups are grappling with the same problems that have bedeviled small businesses here for years. In an effort to confront a big one — lack of financing — the Central Bank launched a low-interest loan program in 2016 that aimed to encourage small players, especially in key industries like renewable energy. One thing that hasn't changed: the layers of bureaucracy that businesses must navigate. Gamal had to get licenses or permissions from at least 10 government agencies. He's become so adept at dealing with red tape that he has a printer in his car. "People say, 'You must know someone' or 'You must have bribed someone' or 'That 5% loan isn't real,' " Gamal said. "But the opportunities are there. I just never take 'no' for an answer." The Antiquities Ministry announced on Monday the paving, equipping, and renovation of walkways between Buildings 7 and 10 of the Karnak Temple complex, in order to accommodate the walking-impaired. The announcement came as part of a larger plan by the ministry to rehabilitate archaeological sites and open museums to better suit visitors with special needs. Secretary General of the Supreme Council of Antiquities Mostafa al-Waziry reported that these walkways will be built along the temple's second axis. The project will also link the first and second axes of the southern sector with the side corridors next to the Holy Lake. Waziry also announced that the restoration work of Akh-menu, built by King Thutmose III, is complete. The old work of the 1990s have been removed to make way for newer restoration methods. He added that the internal compartments of Khonsu Temple and the statues of King Seti II have also been renovated. According to archeological officials, the renovation of walkways in Luxor sites is a part of a project sponsored by the Luxor Governate's local authorities, in cooperation with the Ministry of Antiquities, to increase accessibility across the city. 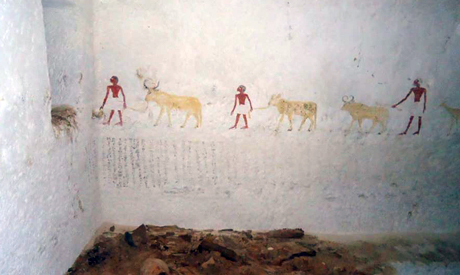 An Egyptian-Australian archaeological mission from Macquarie University, led by Dr. Naguib Kanawati, uncovered the burial chambers of the two Middle Kingdom Elites, named Remochetni and Baqet II during cleaning work carried out inside their burial shafts inside their tombs in Beni Hassan Necropolis in El-Minya Governorate. Dr. Mostafa Waziri General Secretary of the Supreme Council of Antiquities announced and explains that the mission has started its work on site since 2009, and has succeed to uncover these burial chambers during the last week of its current archaeological season. Dr, Ayman Ashmawi, Head of the Ancient Egyptian Antiquities Sector said that the burial shaft of Remochetni tomb is f 17.5 m deep and leads to a chamber with a second burial shaft of 3 m deep that slope downward to reach the tomb’s main burial chamber. 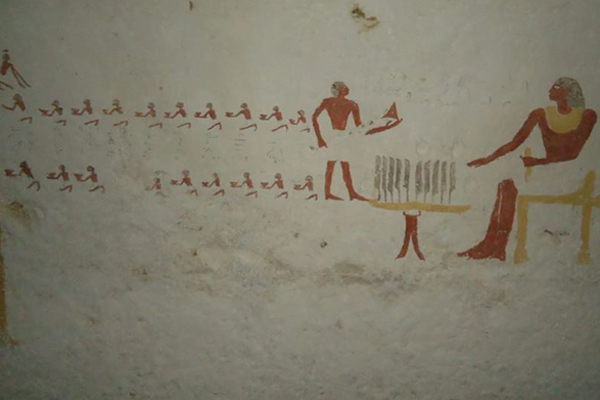 It is an empty chamber with a rectangular shaped pit, probably used to erect the sarcophagus, which was presumably removed by British Egyptologist “Percy E. Newberry” who worked in Beni Hassan during the end of the 19th century. Dr. Ashmawi pointed out that the burial chamber has two small side chambers at its eastern and wester corners and they house a number of food containers made of clay. On his part, Gamal Elsemestawy General Director of Middle Egypt Antiquities Department said that the mission has also uncovered the top edge of Baqet II’s burial chamber as well as other sided chambers. It has the same architectural design of those burial chambers found in Remochenti tomb. The mission has also found paintings on the walls depicting coloured scenes in a good condition of preservation as well as a number of pottery vessels. Dr. Naguib Kanawati Head of the Misssion said that as the work season is coming to an end, the mission has blocked the entrance of the chambers by rubble to protect it. The mission will resume the wok in January 2019 in order to clean, restore and study the wall paintings as well as fully documenting the shafts and its burial chambers. The entrance to the West Valley of the Valley of the Kings is seen here. in the West Valley, archaeologists are excavating what may be the tomb of Tut's wife. The house of Theodore Davis (1838-1915), a wealthy man who explored the Valley of the Kings, can be seen in this image. Before ancient Egyptians constructed a tomb they would dig holes that contained buried artifacts. The tomb would then be built nearby. Recently, in the Valley of the Kings (where King Tut was buried), archaeologists unearthed a set of these "foundation deposits," but to their puzzlement, no tomb has been found. Discovered in 2010 near the tomb of King Ay(who married King Tut's widow), four foundation deposits were found that hold a blue-painted vase, knives with wooden handles and the head of a bovine. The four foundation deposits are in a rectangular shape. A radar scan of the site, in the West Valley, showed an anomalous void that hinted there was a tomb entrance near the deposits. Excavations resumedin January 2018. However, no tomb has been found. "We did not discover anything yet in the West Valley," Zahi Hawass, a former minister of antiquities who is leading excavations, told Live Science in an email. The team dug down to the spot where radar indicated that a tomb entrance may be located, but the researchers found nothing. The team is still digging in other areas near the foundation deposits in hopes of finding the tomb. Hawass is undeterred, and his team will continue their dig. "Through my experience with radar, I want to tell you that radar never made a discovery in Egypt," Hawass told Live Science. "My excavation is not at all depending on any radar reading." The use of radar has proven problematic in the Valley of the Kings in the past. In 2016, a radar scan showed a hidden chamber in Tutankhamun's tomb, but later scans showed that the chamber doesn't exist. Most archaeological discoveries in the Valley of the Kings were made before radar was even invented. Howard Carter discovered King Tut's tomb in 1922, after years of excavations. In addition to work in the West Valley, Hawass is also starting to excavate in the East Valley, where archaeologists have found most of the Valley of the Kings tombs to date. Hawass has long been convinced that more royal tombs remain to be found in the Valley of the Kings. "The tomb of Thutmose II, not found yet — the tomb of Ramesses VIII is not found yet. All the queens of Dynasty 18 [1550-1292 B.C.] were buried in the valley, and their tombs [are] not found yet," Hawass said in 2013 during a lecture at Toronto's Royal Ontario Museum. While Hawass' team has not yet found the tomb suggested by the foundation deposits archaeologists have made other discoveries in the Valley of the Kings in recent years. In 2014 a Swiss-Egyptian team found a new chamber full of the mummified remains of princes and princesses in a tomb called KV 40 that was originally discovered in 1899. Evidence of an ancient flood-control system was found recently in the Valley of the Kings by a team led by Hawass. Dubai has welcomed its first pharaonic restaurant, and ancient luxury doesn't get much better than this. KHOFO has opened its doors in Al Seef, and it's more than fitting of Egyptian royalty. 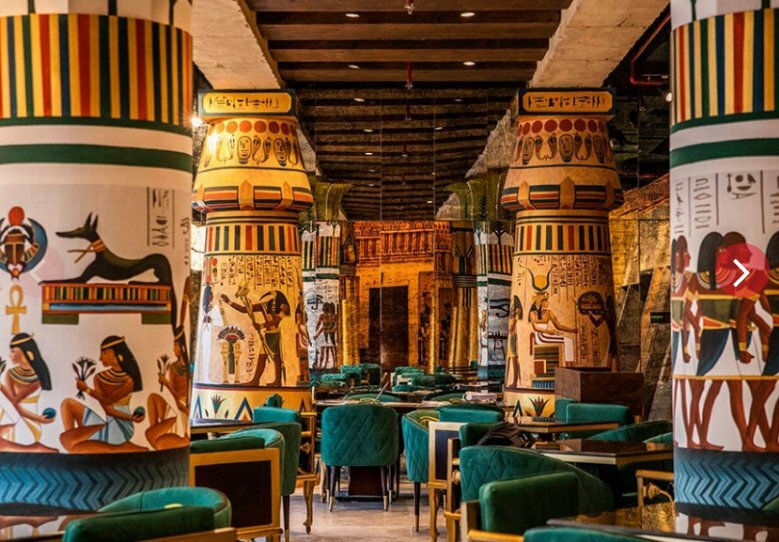 The restaurant is spread across 7,500 square metres with stately columns, hieroglyphic murals and waiters dressed up as the ancient pharaohs themselves. 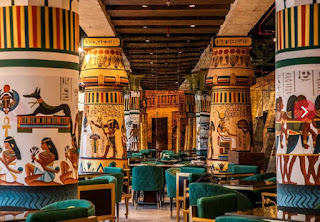 The majestic indoor and outdoor space promises to transport you back to the time of King Khufu's reign, and that's before we get started on the food. You can expect a load of authentic Egyptian recipes rooted in culinary traditions. Start the day right with an Eygyptian breakfast composed of eggs, foul and falafel or get stuck into local Egyptian favourites like molokia ( a soup made from mallow leaves), okra, oxtail soup, mahashi (assorted stuffed vegetables) and hawawshi (pita bread and minced meat). Majid Al Usaimi, Owner for KHOFO Restaurant said, "KHOFO concept was incepted from our desire to offer the residents and visitors of Dubai a never seen dining experience and we hope to set ourselves apart by offering food-lovers an entirely innovative pharaonic concept. "We pride ourselves for our friendly attentive service in a sophisticated yet welcoming environment which will undoubtedly take diners back to ancient Egypt. Our decor and food are both inspired by our unique approach to hospitality, wherein creativity, quality and distinctiveness are primary." We can't wait to feast like pharaohs. Open Sun-Thu 8am-midnight; Fri-Sat 8am-2am. Al Seef, Dubai Creek (04 388 5005). This week, our guest blogger Katherine Piper is back from Italy to tell us her thoughts on the Museo Egizio in Turin. The largest Egyptian heritage museum outside of Egypt, the Museo Egizio's history stretches back to the earliest days of Egyptology. In addition to the famous so-called Turin King-List, the museum is well-known for its royal statuary and its display of the complete tomb assemblages from the intact tomb of Kha and Meryet at Deir el-Medina. Don't miss the Nile Scribes' Insider Tips at the bottom! As a long-time student of ancient Egypt, the Museo Egizio has been on my bucket list of Egyptological destinations for several years now as the oldest and one of the largest Egyptian collections outside of Egypt. The museum recently underwent extensive refurbishment with the galleries and displays being overhauled and re-opened to visitors in its new format in 2015. I was fortunate enough to attend a lecture in London given by the museum's director, Dr. Christian Greco, about the refurbishment at the time. I was not only interested to see the collection, but also to see how it was presented given its relatively recent redesign. As the museum's collection is so vast, I'm not going to attempt to review the entire museum, but highlight aspects which I thought were particularly impressive. Later on, Ernesto Schiaparelli, who became the museum's director in 1894, founded the Italian Archaeological Mission in 1903 with the specific aim of excavating at sites to acquire antiquities which would fill particular chronological or cultural gaps in the museum's collection. From a modern perspective, this seems like the height of colonialist cherry-picking, but it is highly commendable that the Museo Egizio is upfront and honest about its former acquisition policies in the first gallery visitors encounter. The gallery experience proper begins on the top floor of the museum. The material is arranged chronologically, so the visit begins in the Predynastic Period and works its way through the ensuing periods on the top floor. The Middle through the New Kingdoms felt a little rushed, especially considering the wealth of First Intermediate Period tomb assemblages on display (though as the First Intermediate Period is often overlooked in favour of the Old and Middle Kingdoms on either side of it, this is no bad thing). Of course, much museum space is devoted to particular periods or themes is always a curatorial balancing act. Given that two large rooms on the first floor hold the Museo Egizio's showstopper collection from Deir el-Medina, it makes sense. Something which impressed me was that every display of human remains was prominently marked with a red triangle with a picture of a mummy on a top corner of the display case and an information panel. This way, visitors can choose to avoid these displays if they so wish. The red triangle markers are particularly effective in a busy museum as they can be seen from a distance, so for those who don't desire to see human remains on display, visitors are properly warned. The ethics of displaying human remains in museums is a contentious topic, but, personally, I thought everything in the Museo Egizio was displayed thoughtfully and respectfully. For me, one of the most impressive things about the Museo Egizio was that wherever possible, material was presented as it was found, e.g. tomb assemblages are displayed with the objects from the tomb group rather than laid out individually and deprived of their holistic context. Much of this work was possible thanks to the notes of Schiaparelli's assistant Virginio Rosa – and a lot of careful archive work. I think the decision to make the museum fit the material rather than vice-versa really raises the level of the visitor experience. An excellent interactive feature throughout the museum is the series of "Egizio Essenziale" scent boxes in which visitors can sample scents which formed part of the ancient Egyptians' world. The boxes come with a short explanation: you can breathe in the scent of cedarwood whilst looking at coffins, or frankincense and myrrh whilst admiring temple statues of Sekhmet – and what is more evocative and transportive than smell? There are vents at different levels on these scent boxes to make them as accessible as possible. Overall, the museum strikes the right balance between singular displays of smaller objects and displays of item groups to retain as much of their original context as possible. The temptation to be grandiose is resisted until the final two rooms of the tour: the Hall of Kings, where the museum's collection of monumental statuary is displayed in truly spectacular fashion. These rooms (designed by a movie set designer) have low lighting save for the spotlights focused on the statues and multiple floor-to-ceiling mirror panels. As grand finales go, it's hard to beat this display. There is also a small room off the Hall of Kings which contains pieces from Nubia including the rock-cut Ellesiya Temple. It was carved during the reign of Thutmose III and was one of the temples saved from the rising waters of Lake Nasser during the construction of the Aswan High Dam in the 1960s. I found it very strange to be standing in what was unmistakably an Egyptian rock-cut chapel in a museum in Turin, Italy – but far better than to have the temple only be accessible by diving! I travelled all the way from the UK to Turin to photograph 3,000-year-old furniture for research (as one does). My research is based on my fieldwork as part of the South Asasif Conservation Project on the west bank of Luxor, where my job is to work with the thousands of fragments of painted ceiling from the Twenty-Fifth Dynasty tomb of Karakhamun (TT 223). Part of my research covers the history and development of the patterns used to decorate tomb-chapel ceilings prior to the Twenty-Fifth Dynasty including contexts in which the same patterns were used to decorate things other than ceilings. I knew that there were several wooden chests from the Eighteenth Dynasty tomb of the Deir el-Medina architect Kha and his wife Meryet on display at the Museo Egizio in Turin which were decorated with these 'ceiling' patterns, so it seemed like a perfect excuse to visit. The real strength of the Museo Egizio, however, is not just the breadth and quality of its collection, but the thought and care put into the displays and the value added to the visitor experience by features like the scent boxes. Visit if you can – this is a museum that really wants you to enjoy it. Head of Central Administration of Maintenance and Restoration at Ministry of Antiquities Ghareb Sonbol announced on Tuesday that the Ministry has brought in a specialist of human remains to conduct necessary studies on the skeletons found in the mysterious Alexandria sarcophagus, uncovered in the Sedi Gaber area. Sonbol revealed that the study and research on the remains would start on Sunday, aiming to identify their ages, genders and historical era. Egyptian archaeologists dashed local hopes that the newly discovered ancient sarcophagus might contain the remains of Alexander the Great, finding instead the bodies of what appeared to be a family of three. Workers inadvertently unearthed the approximately 2,000-year-old black granite sealed sarcophagus earlier this month during the construction of an apartment building in the historic Mediterranean port city of Alexandria. 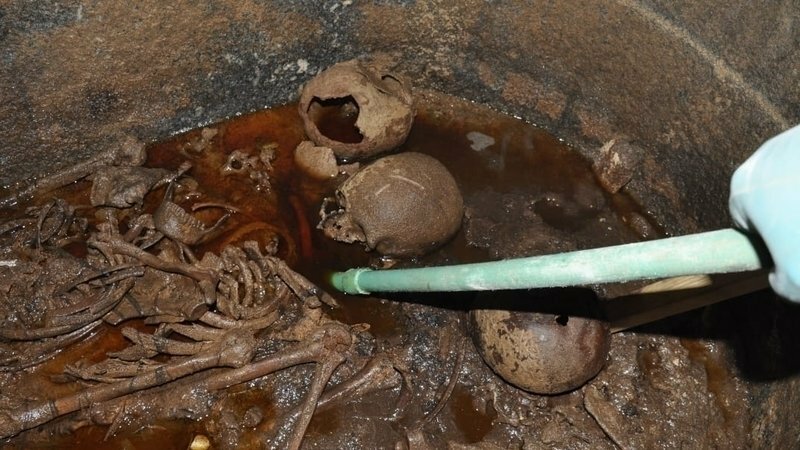 Upon opening the black granite sarcophagus, archaeologists found three skeletons and a red liquid speculated to be sewage water that leaked into the coffin, causing the mummies to decompose according to an Egyptian Ministry of Antiquities report. Have you ever taken a close look at the objects in the museum and wondered about the mounts that hold the artifact securely to the display? Mountmakers work hard to disguise them as it is not our intention to draw your attention away from the artwork. The mounts can be disguised by painting them to match the color, pattern, and tone of the object. Mounts serve many crucial purposes. Aside from holding an object at a particular angle that is best to view it, a mount can also serve as a way to secure an object from physical forces. These forces can include someone accidentally bumping into a case or pedestal where the object stands or even the possibility of an earthquake. 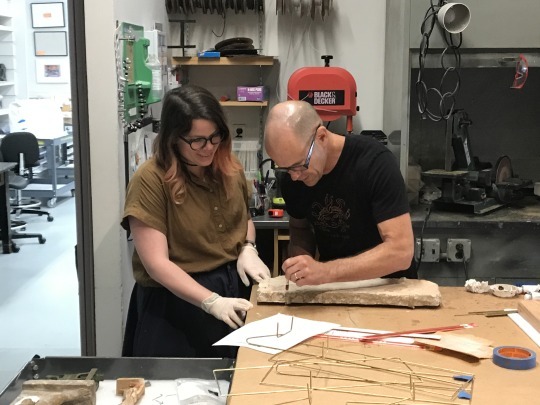 When an object is being prepared for a traveling exhibition, conservators must research the locations the object will be exhibited to determine whether or not there is a high risk of earthquakes in that region. Another consideration for mounts is to serve as a security device. Sometimes objects are displayed outside of cases, and it is important for a mount to secure the object to the pedestal so that it does not fall or get disturbed. 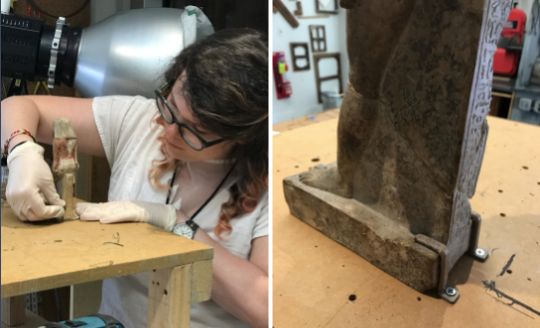 Art conservators at the Brooklyn Museum work closely with the mountmakers to ensure that they are aware of the individual vulnerabilities of the object. They must work together to design an effective mount that is sensitive to the individual needs of the object while also being aware of the ultimate settings that the object will be displayed. Many mounts require metalsmithing skills and are finished with the addition of materials that can provide padding. These materials must be physically compatible with the surface of the objects being displayed. Another consideration art conservators contend with is the possibility of certain materials in the mount and display cases off-gassing pollutants that could be damaging to the object. This is why every mount and display material is rigorously tested in an accelerated aging test known as an "Oddy test." 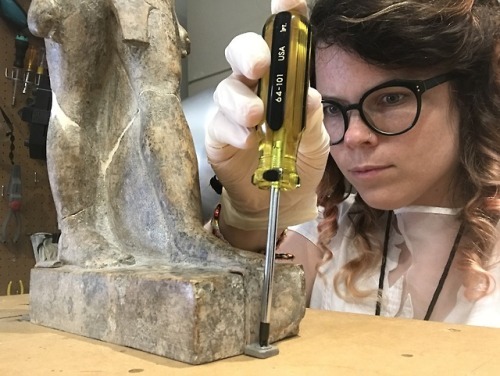 The Brooklyn Museum tests any material that will be used for display to make sure there is no danger of volatile acids or other pollutants that can cause damage to the object. Next time you are walking through the museum, take a closer look at the mounts. You will be amazed at the artistry, creativity, and science that goes into their creation. The government argued that the measure was to introduce discipline in the domain and reorganise it with new regulations. CAIRO - The Egyptian government's new requirement that cultural festivals get permission from the Ministry of Culture has riled intellectuals, who see in it an attempt at censorship to stifle creativity and impose co-option. Egyptian Prime Minister Mostafa Madbouli's decision would create a higher commission for organising festivals and private concerts, presided over by the Culture minister and include representatives of the Foreign Affairs, Interior, Finance and Tourism and Antiquities ministries in addition to heads of artists' and writers' unions and cultural experts chosen by the minister of culture. The decision defines "cultural festivals" as local or international cultural and artistic events of a celebratory character, state-organised or otherwise, and aiming at promoting artistic and cultural creativity, preserving cultural heritage and enacting cultural exchange between Egypt and the rest of the world. The most controversial aspect of the decision was a clause concerning festival organisers' obligation to secure government pre-approval. Clause 2 states: "It is forbidden to organise a festival or a public celebration without prior permission from the Ministry of Culture, which will coordinate with the concerned state agencies, including the tax administration and the internal security." Minister of Culture Ines Abdel Dayem described the measure as "a comprehensive and objective approach by the government to place the events on the right track within the framework of an official agenda." Those involved in culture in Egypt stated disappointment with Abdel Dayem's decision. The minister is a well-known flutist who took over the ministry in January. Many expected the "Solo Queen," as she is affectionately known, to champion freedom of expression and artistic independence because she had considered herself part of the innovative current rather than part of the administrative machine. Most people were not convinced by arguments advanced for the decision. It was a blunt decision and its objective was clear: It marks the end of free artistic and cultural life and the beginning of the ministry's control of this domain. The worst hit by the decision were Egyptian impresarios. They said "the decision was vague and shocking. It returns the country to the Dark Ages of state control of intellectuals and of discouraging bureaucracy." Cultural activities must remain free and far from the shackles of heavy government bureaucracy, they said. Writer Hana Naseer, a member of the organising committee of a conference on free poetry, said the natural reaction was to refuse any measures that would exacerbate the decline of culture in Egypt and of Egypt's cultural role in the Arab world. Culture is supposed to be one of the weapons in the war against terrorism. Naseer said it was imperative for intellectuals in Egypt to oppose any form of government control on culture and creativity. "We warn against the return of totalitarianism," she said. "The regime is trying to control all channels for enhancing the consciousness of the different social classes but this dangerous approach has led a few decades ago to an ugly Arab defeat whose painful consequences are still with us today." Poet Mahmoud Sherif, head of Tanta's International Poetry Festival, said the ministry's decision did not clearly delimit its prerogatives nor did it fix the criteria and conditions that must be made available for a festival to be allowed. The ministry's role and commitments towards the events that eventually receive permission were not included in the decision, he said. Writer Mohamad al-Baali, head of Cairo's literary festival, said the ministry's decision was another attempt to control cultural life in Egypt and return to the doctrines and practices of the 1960s when art and culture were tools for mobilising society in the service of specific political goals. He said that, if the decision was implemented, it would mark the end of independent cultural production and many youth-organised cultural events. Poet and critic Omar Shahraiar agreed, saying the decision is likely to kill personal initiatives and cultural activities by civil society organisations. When independent cultural activists are forced to comply with government routine and bureaucracy, they will simply stop their cultural activities, he says. Shahraiar said it was incongruous that the government's decision came when intellectuals should join ranks to fight terrorism and extremism but with this move, the government was practically preventing the country's intellectual elite from doing its patriotic duty. Sherif al-Shafei is an Egyptian writer.